CBRM Handi-Trans is able to drop passengers off right at the entrance to the festival site. This is also available for passenger drop off. Ashphalt paths are free of obstacles for those utilizing mobility aids. Service animals are permitted and water bowls can be provided on site (see Staff for details). Festival staff will assist with any accessibility needs. We’ll be the ones with the Makin’ Waves t-shirts! Contact us by June 22nd with any special accessibility requests. Avoid the parking challenges by walking to the festival site. If you are within 1km of Wentworth Park, it is only a 10 minute walk! Refuse plastic straws and bring your own cutlery to cut down on plastic waste. Instead of bringing packaged snacks, consider bringing fruit or vegetables in reusable containers or bags. Sort your food truck waste with our compost, recycling, and garbage stations in the park. Since the founding of Sydney in 1785, Wentworth Park has been an integral part of community life for the area. Originally known at Freshwater Creek, the area was renamed Wentworth Creek in honour of John Wentworth, former Lieutenant-Governor of Nova Scotia from 1791-1808. Wentworth originally had reserved 100’ on each side of the creek from Argyle Street to Kings Road to be used as a government shipyard or timber reserve, though the public mostly used these lands as a park. By 1934, the properties were turned over to the City of Sydney. A wooden bandshell, constructed in the early part of the 20th century, was replaced with a concrete structure by the Kiwanis Club of Sydney in 1962. The current facade of the bandshell began in 2007 as part of a $2.3 million renovation to the park and its facilties. For many residents of Sydney, Wentworth Park has been synonymous with music and community. 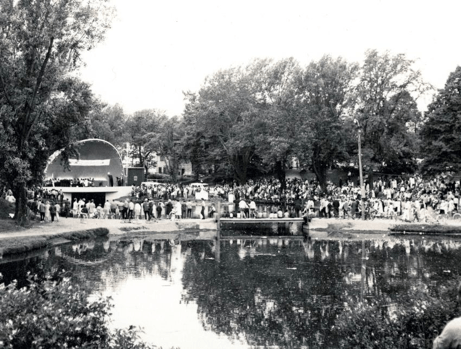 Since before the construction of the iconic concrete bandshell, musical performances were drawing audiences to the park for social occasions and community celebrations. In 1967, Sydney celebrated Canada’s Centennial with a concert in the bandshell and, throughout the 1970s and 80s, the park was frequented by residents on Friday nights coming to see live music at the bandshell. In addition to the bandshell, Wentworth Park is a stunning example of an urban multi-use park. It is divided into two distinct pieces by Bentinck Street, which creates a direct connection from the Sydney Waterfront District to either end of Wentworth Park. A modern playground is located on the east park, while a splash pad in the west park is frequented by families throughout the summer months. The gazebo, also located in the west park, is often used for photos during prom season or for weddings in the area, while the ashphalt paths make the facility perfect for a leisurely stroll or as a part of your active living regime. And there are the ducks. For many families, feeding the ducks at Wentworth Park is an activity passed on from parents to children for many generations. The park is home to dozens of mallard ducks who live there year round. While many residents come to feed bread to the ducks, this type of food is not condusive to the longterm health of the birds. It is recommended to feed the ducks halved grapes, corn, or leafy greens torn into small pieces. Whether you live in the area or are here for a visit, Wentworth Park has a lot to offer. From leisure and family activities to events held on the grounds througout the year, it is the perfect place to make memories that will last a lifetime.